Errant cyclist on the rise ? 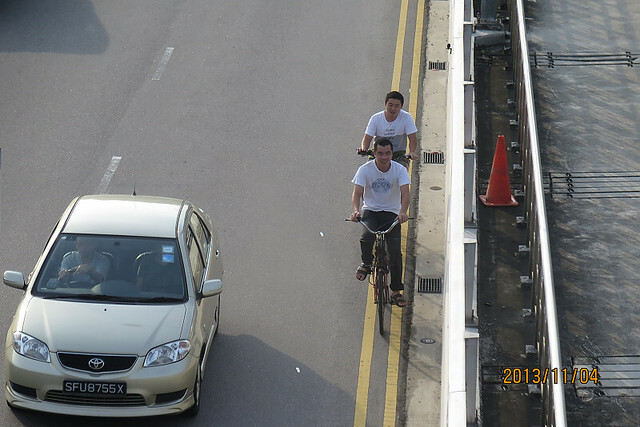 There were 1455 traffic violation committed by cyclists in 2013. No one was killed due to these offences. All together there were 367,496 traffic violation committed by motorists in 2013. 159 persons were killed which included 43 pedestrians. When I’m looking through this striking comparison, it occurs to me that there are 250 times more offences committed by motoring and each of these offences has at least 10x higher potential to kill or to cause serious injuries. Shouldn’t we put 2500 times more attention and effort to reduce the bigger, more dangerous offences? This entry was posted in News, safe road on 2015-02-27 by Francis. Recently 5 cyclists died in London within a short period of 9 days. At the same time New York CitiBike just just completed 5 millions rides over the first 5 month without a single person killed. Consider the CitiBike is used by all sorts of people from young to elderly, including tourists, this contrastic experience between London’s deadly “Cycling Superhighway” and New York’s bicycle friendly design contains a lot to be learnt. A short video released by The Guardian provides a close look of London’s “Cycling Superhighway”. An experienced cyclist will be able to point out a few design issues relates to cycling safety. Some say more death is expected because new bicycle facilities attracts more people to use bicycle and therefore more accidents is inevitable. I think this is purely nonsense. If that’s true, New York should report similar number of cyclist death during that 5 millions rides. “Your job is directly affecting people’s life and everyday wellbeing, please consider the vulnerable road users when designing.” If New York can do it, so does other cities, just don’t repeat the mistakes made by London’s road planners. Fig. 1 Wide and straight, does this looks like a road you can drive fast? Painting half a car lane and call it a bicycle superhighway, this design suggests bicycle is to mix with high speed traffic .. Fig. 2 Driver abuse the bike lane by parking there, exactly as some people mentioned the reason not to have bike lane… but it doesn’t have to be like this. In New York, the parked cars are used to provide a safety barrier between cyclist and fast moving traffic. Fig. 3 The “Bike super highway stop abruptly, not transitition space to prepare the dirvers and cyclists to slow down when they have to directly mix on the road. Extremely dangerous, by design. Fig. 4 Here an example of a fast van just over took the cyclist (who took this video) very closely because the driver is forced to share half a lane with the bicycle. Fig. 5 Finally a segregated section of the BSHW, it only allows one bicycle at a time and the separation from big lorry is way too little. Pathetic, but at least it is relatively safe compare to other parts. Fig. 6 The separation suddenly stop!!?? What are you supposed to do here, the cyclist is right at the blind spot position of turning long vehicles. Fig. 9 The BSHW suddenly end right before a junction. What are the cyclists supposed to do here? Fig. 10 Let’s mix with the traffic again.. Fig. 12 Now this is a proper bike lane, wide enough and with good separation when there is fast moving traffic. Having heard about and seen the painted cycle lanes and advanced stop boxes of London, I thought London was cycle-friendly until I tried riding on the city roads one evening … and nearly got knocked off the bike twice on a short 25mins ride (once by a car, once by a bus). Personally, the poor cyclist safety in London is not just a question of infrastructure, although it stems from infrastructure. The road culture in London is, to sum up in one word, aggresive; aggresive drivers, aggresive cyclists. Aggressive attitudes from both sides does not serve anyone well. On London roads, I see cyclists riding at speed along the roads, not alone, not in twos, not in threes … but in hordes. And this at peak hours of the day. I haven’t been to Amsterdam, but from the many videos I have seen, my feel is that the road culture is different. This entry was posted in daily commute, safe road, Uncategorized on 2013-11-19 by Francis. 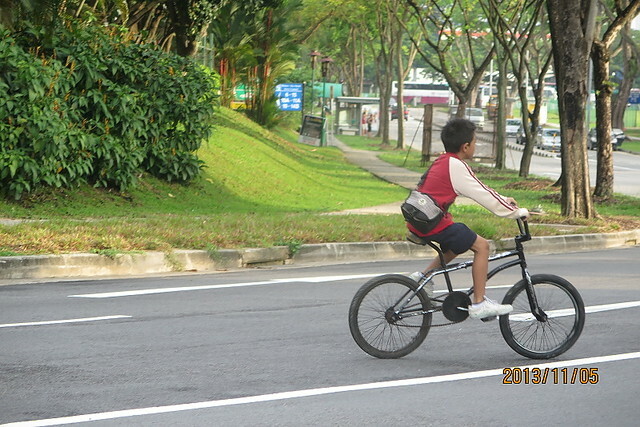 These are some of the people I randomly came across who are using a bicycle on Singapore roads. 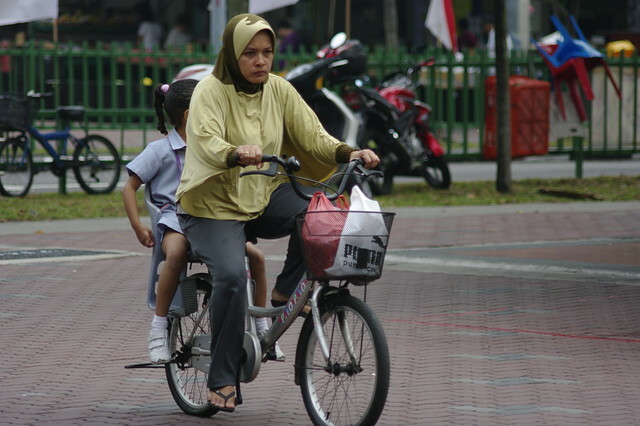 Some bring their children to school on bicycle, some bike to work or school directly, ride to the market, to visit a friend or just to have a coffee at nearby food center. 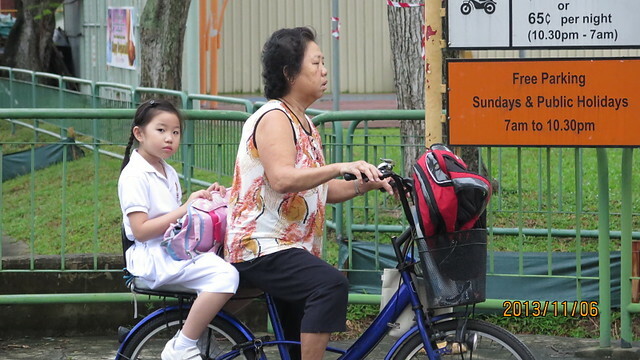 There is a wide spectrum of bicycle users in Singapore. However they are typical the “silence majority”. They are not vocal in media, you don’t read them on Stomp or other online forum. They hardly write to the newspaper. But many of them have the right to vote. Introduce safety space on roads for them and they will feel it and definitely appreciate it. Every parent who bring their kids to school on bicycle is helping to remove one car from the morning traffic congestion. 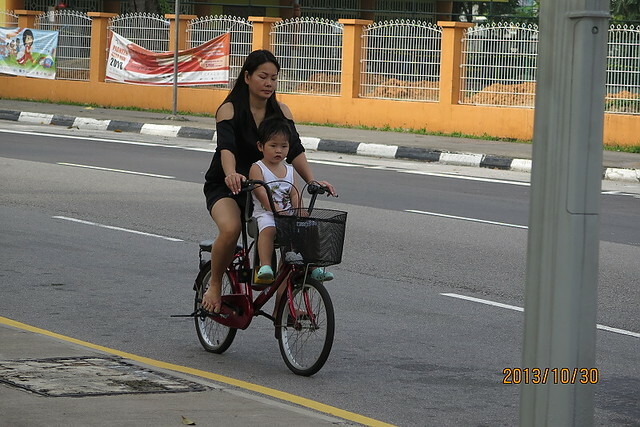 But the above lady need to exposed her child and herself to the risk of car traffic by cycling in a narrow gap between the cars and the curb. Struggling to balance the bicycle within such narrow margin, her handle bar or pedal may scratch the car. 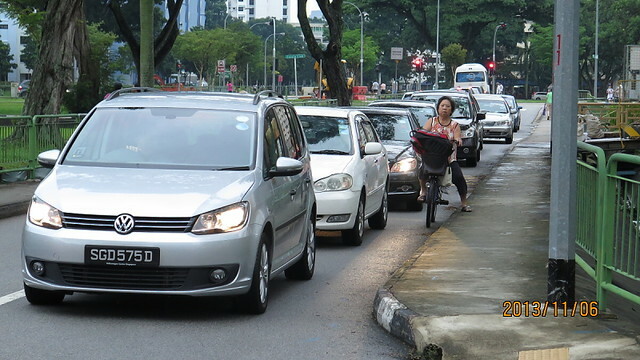 Such situation invariably creates tension between cyclists and drivers. Opportunity is hidden in plain sight! The pavement is empty on her left, she could have make use of the pavement if it is better designed. 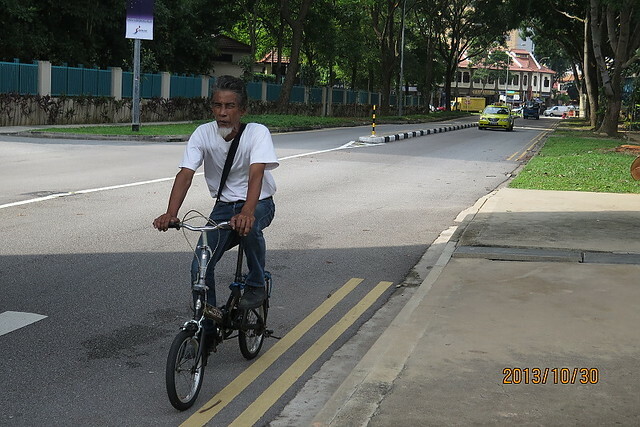 This is one example of many opportunities to make cycling safer in Singapore. This entry was posted in bike2work, daily commute, safe road on 2013-11-17 by Francis. At first glance, it looked like any busy intersection. But from where I stood, you could see that because of the way the road is angled, a bus has to make a wider turn than cars, and unless the driver turned his head all the way to the left, it is possible to miss someone beginning to step onto the junction to cross it. Could the driver involved have missed seeing Madam Zhang and, in that split second, a life was lost? We don’t know yet what happened, so it’s best not to speculate about how it happened or who was responsible. I am no road safety expert and I don’t normally do traffic accidents in this space, but there are two issues that have wider implications beyond that tragedy. The first has to do with the depth of investigation and level of professionalism undertaken whenever a fatal or serious accident occurs. It is pertinent to ask how thorough the investigations after the two previous fatalities were and if any recommendations were made to improve safety at this junction. And what did SBS do to alert its drivers about the possible blind spots there? Some of those interviewed in news reports wondered whether, at such a busy junction, when the lights turn in the pedestrians’ favour (blinking green man), vehicles should be allowed to make the left turn. When it involves right-turning traffic and pedestrians crossing, it’s even more tricky. The motorist has to look out for not only incoming traffic, but pedestrians as well. At some junctions, it’s an accident waiting to happen. These issues raise the question of whether we have experts with deep knowledge and experience to spot a safety weakness not immediately obvious to the layman. It calls for a high level of professionalism of the staff involved in the various government agencies – in this case, the Traffic Police and Land Transport Authority (LTA). But more important is the corporate culture in which every staff member, from top management to police on motorcycles, takes ownership of road safety and feels responsible for improving it. It requires lower-level staff to be empowered to constantly and pro-actively look out for weaknesses in the system and not just do their narrowly defined jobs. When front-line staff are not empowered, they stop giving feedback on matters beyond their own tasks, whether it’s about overcrowded trains, clogged drains or unsafe roads. This is exact scenario at east coast road with still road. i driving as driver A always from my house to PIE. is dangerous indeed. Is absolutely dangerous. Driver A will see green light and a small window between two cars coming from opp direction, will try to rush in ignoring the pedestrians which are on green as well. If he slows to avoid pedestrians he may get hit from oncoming traffic. I have seen it before at Jurong East library. The solution is to have green for going straight and the pedestrians. Then red the pedestrians and allow turn right only. yes, that will create bigger jams so probably that’s why is not used. Right yes, there are a few left turns that cuts across pedestrian paths that allow traffic to make it in very fast and its very very dangerous. along lavender st. Such turnings should be redesigned to slow down traffic that are turning in! This is the most dangerous road scenario i keep reminding my kids to watch out for vehicles in front and behind them. I think that two pedestrians crossing from the opposite side are at higher risk. It is hard for the Taxi driver to notice them, especially if they dash across on their bicycle. 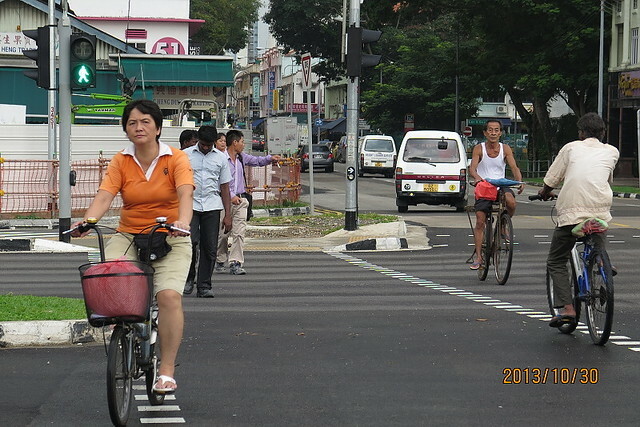 This is why it is encouraged to slowly push the bike over when crossing at such junction. Nothing is wrong with the design. I am of the opinion that we, as pedestrian, must at all time use the road responsibly – walk fast, watch out, don’t daydream, stop using earphone, and so forth. As a driver, we must exercise “Patience” – don’t race, leave home earlier to avoid rushing, stop using the phone, and so forth. The design may be fine, for many years, but many things have changed in the recent decade+. Cost and pressure of living has increased, more cars and traffic, new and mixed cultures among road users (both pedestrians and all kinds of drivers). Maybe can check the statistics over the years if it support my conjecture. Thus, maybe it is time for the UN to recommend a standard road design and/or principle, at least for all major cities. There’s quite a lot of roads with these kind of junctions, in many cases (driver A) is not supposed to turn right from where he is until the green man turns red and the signal for him to turn right lights up as green,but in several cases i have seen drivers turning quickly to overpass drivers going straight from Driver B’s direction. This entry was posted in safe road, Uncategorized on 2013-05-05 by Francis. LTA of London, TFL, is testing out Dutch style road to reduce cyclist related accidents. This year TWO cyclists died in London. Stubborn TFL is now actively learning the best practices from the Netherlands to make cycling work in London. Roundabouts like the ones used in the Netherlands separating cars from cyclists could be used in London as early as next year, the city’s cycling commissioner has said. Trials of the layout are taking place at a research laboratory in Berkshire. The roundabouts do not conform with Department for Transport regulations as they stand. But Andrew Gilligan said if the trials continued to go well they could be seen in 2014. The layout gives cyclists priority and means they are in the line of sight of drivers when vehicles exit the roundabout. Campaigners have called for a number of London junctions to be changed to make them safer following cyclists’ deaths. In 2011 two cyclists died in the space of three weeks at the Bow roundabout in east London. The roundabout trial, which has been going for six weeks and will end in July, forms part of the mayor of London’s Vision for Cycling. More than 600 people have been involved so far and the effects on safety and capacity will be studied. The impact on pedestrians and lorry, van and car drivers will also be monitored. Members of the public can participate in the trials. Other ideas being tested include traffic lights with separate signals for cyclists. Mr Gilligan said: “We’ve got a cycling budget of £913m over 10 years and it includes £100m to refit junctions. Subject to the outcome of the trials, Transport for London (TfL) will work with the Department for Transport to try the roundabouts on the public highway. TfL said improvements at Bow roundabout and a 20mph speed limit at Waterloo roundabout were due to be delivered this summer as part of ongoing improvements. This entry was posted in safe road on 2013-05-02 by Francis.